The idea and vision of a parental ghost returning to spur us to vengeance is quite terrifying and moving, especially to those of us who lost a parent early in life. Although, in some ways, a decent showing of Hamlet can be a cathartic experience that can save a fortune in therapy. As Paul Weller once sang, “that ain’t no ghost it’s a reflection of you”. When the director, Aidan Moran, announced that the lead role would be played by a woman and the play would take place in the atmosphere of an equal society, I am sure most theatre goers would agree with him in asking “why not”? The play has been done in every imaginable way since it was first performed in the very cross-gender theatrical world of the Elizabethan stage. The delivery and physicality of the sublime Megan Turnell, and the controlled power with which she delivered her soliloquys transcended gender, but the change in language and forms of address may have been the most thought-provoking element. Consider the many nuances of the phrase “unmanly grief” to see how that could create a great ripple in our consciousness when expressed about a woman. How language is used to address gender diversity is a red hot issue of the day and was very interesting to witness here, but I didn’t think the theatrescape of an equal society made the performance more florid, deep or rich. No amount of modernity or changes in context or setting alter the dark heart of the subject. If you really wanted to have a contemporary local resonance though, the present Reading FC Manager, Jaap Stam, would make a great troubled Hamlet. The rustic palace setting looked authentic and unfussy; it showed off the acting well by being so open a view. Some of the scenes had been deftly and seamlessly cropped by the director, but no flavour was lost and the opening scenes were especially effective with the introduction of the ghost. The spirit, played with ominous maudlin charm by Jim McGuigan, was frightening enough to feel those hairs stand up, especially under some skilful eerie lighting from Martin Noble and his lighting crew. Kate Shaw made Horatio a fine loyal friend to the princess/prince and complimented the lead role well. John Turner played the regal bombast, and then remorse, of Claudius beautifully and Liz Paulo gave us a softly humble, sympathetic queen. 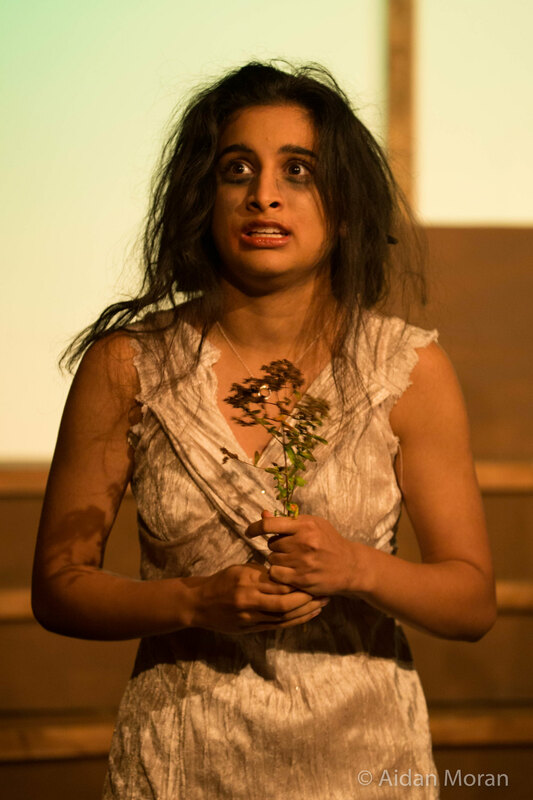 Tanvi Virmani’s tragic Ophelia did pluck the heartstrings of empathy with some lovely delivery and posture while her stage brother Laertes (Alex Critchley) exuded tragedy and menace. 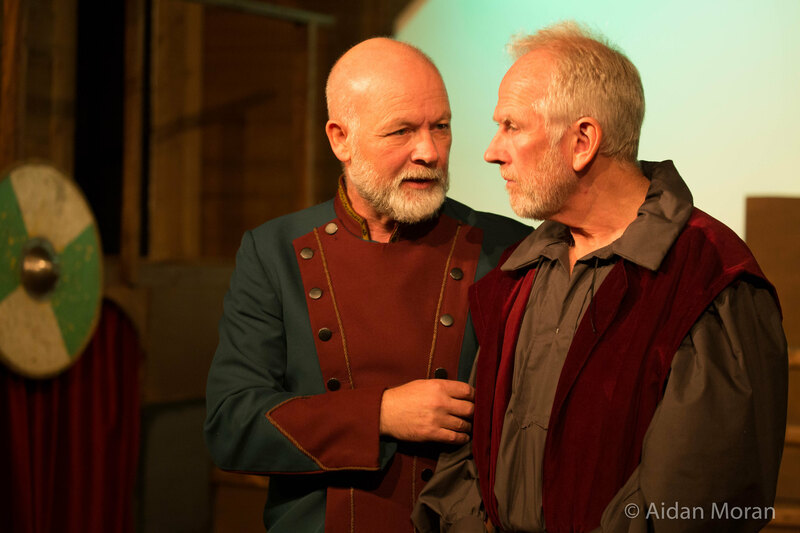 Richard Tripp’s fine performance gave us a real Professor Yaffle type, pedantic Polonius, which chimed beautifully in conversation with the troubled princess/prince. 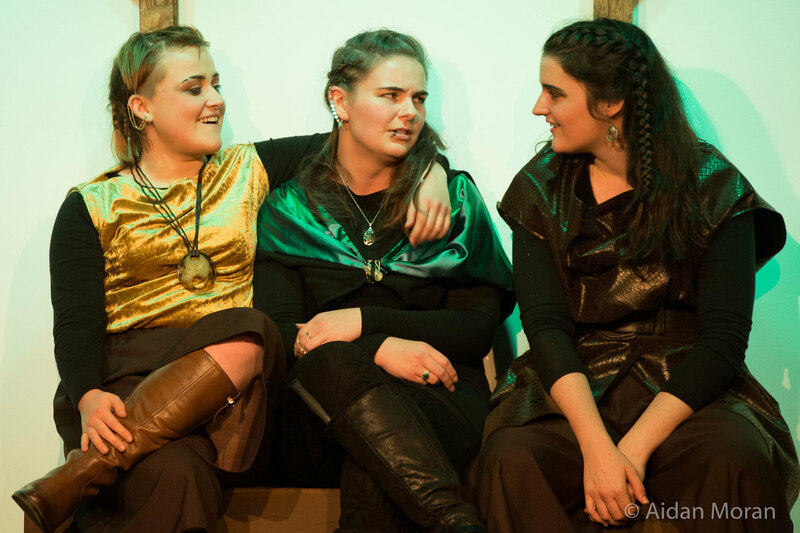 There were remarkably few fluffed lines for an opening night and the physical aspects were very well handled with Steph Dewar, Tara O’Connor and Emma Doyle playing three roles each with a lot of heart and energy. The cast were so busy at times I quite fancied helping out with a bit of grave digging or swordplay, although Mikhail Franklin as ‘gravedigger one’ and simply ‘Dane’, and Claudia Wittowske as Lucianus and ‘player’, acted with gusto and added some light relief from the grave as the play sped towards its grim conclusion. 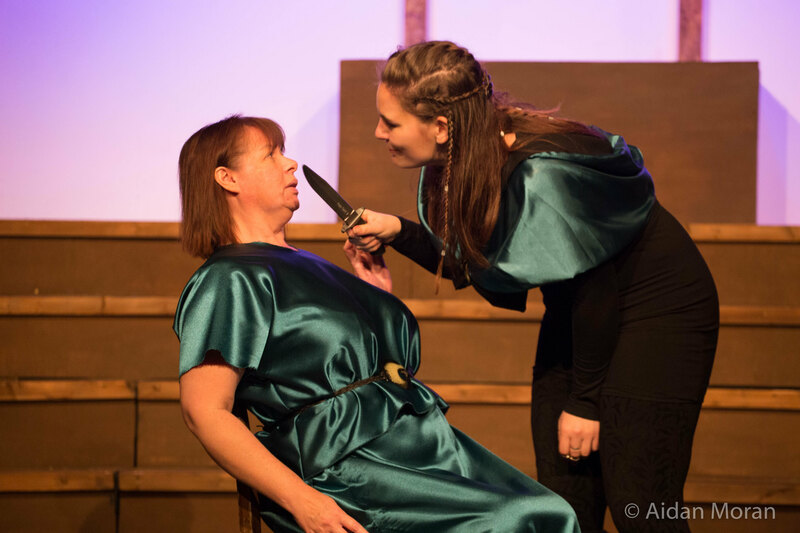 Rosencrantz and Guildenstern were played with effervescent wit, charm and humour by double act Izzy Hayden and Chloe Stoakes. It was a lovely to see some risk-assessment-defying swordplay at the end thanks to some fine work by fight co-ordinator Caroline Stewart. Don’t gabble, don’t shout, don’t wave your arms about, don’t overdo the passion, don’t be too timid, don’t forget the part, don’t strut, don’t go for cheap laughs and remember at all times the play is the thing. All these theatre pitfalls were wholly avoided by the cast, director and crew, so on the approval of the bard I strongly recommend you go and see it. 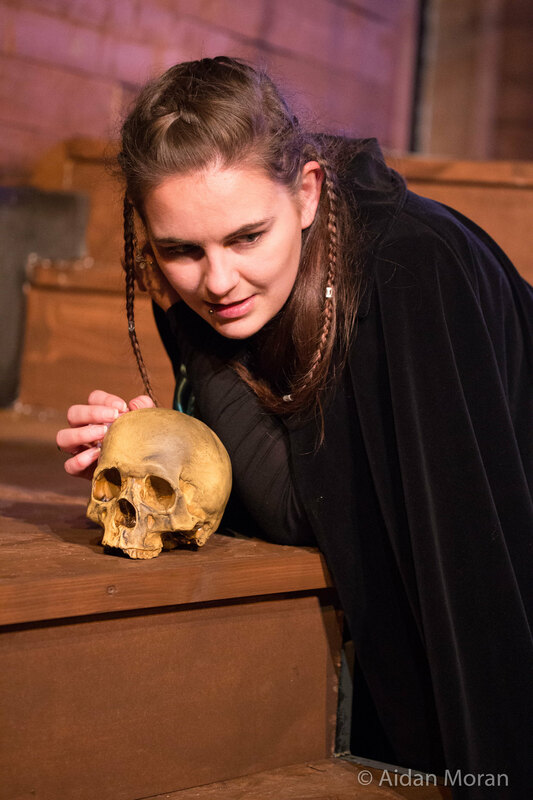 ‘Hamlet’ opens at the Progress Theatre, The Mount, Reading on Thursday 12 October and runs until Saturday 21 October. Tickets can be bought online or by telephone on 0118 384 2169. Matthew Farrall, the author of this article, died on 20 April 2018. We are grateful to his family for allowing us to continue to display his work online.